One of my favorite pieces of music is Igor Stravinsky’s The Rite of Spring. Although meant as a ballet and scored for a classical orchestra, the Rite doesn’t sound anything like what you think of when you think of “classical” music. Instead of being genteel and melodic, it shifts from soft and sensuous to brutal, thundering, and atonal — and back again. It’s so different that it nearly caused a riot when it premiered in Paris in 1913. If you’ve ever had the opportunity to sit in front of a piano, you’ll know it’s relatively easy to make it produce sounds: all you have to do is press a key. On a piano, all the notes you need are easily accessible. However, there’s a wide gap between noodling around and playing something like the Rite, with its nuance, range, and percussive violence. To produce this performance, Say had to first master his instrument. Musicians aren’t the only ones who use instruments; scientists have them too. Instead of using them to create art, scientists’ instruments allow them to see things the rest of us can’t see. In the 17th century, Galileo Galilei created a telescope that allowed him to look at the heavens in a new way, ushering a new understanding of the universe. Galileo, too, mastered this instrument. A telescope is not the same type of instrument as a piano, but they do have some things in common. These are not mere tools. People like Galileo and Say spend a considerable part of their lives familiarizing themselves with their instruments. These instruments become extensions of themselves which they use to probe the universe — and put dents in it, too. They practice on their instruments, always trying to improve. They take great care of them, making sure they are in proper working order. They treat their instruments with great respect, perhaps even reverence. As a designer, I think a lot about my instrument. You may be thinking I’m talking about a software tool like Adobe Illustrator, or maybe paper and pen — but I’m not. I consider my consciousness to be my primary instrument. My ability to be present — to bring my full awareness to a situation — is the one thing that is essential for me to do my job and to do it well. I care for and respect this instrument. I avoid doing things with it that may damage it or make it “go out of tune.” I study its capabilities and nuances. I practice daily. (Mindfulness meditation, in case you’re wondering.) I think of it as a combination of a scientific instrument and a musical instrument: when functioning properly, it allows me both to perceive things more clearly and create new things. It also makes it possible for me to empathize and communicate better with other people. I aim to master this instrument. Getting the computer to do anything required learning arcane incantations and typing them into a command line. While some — such as LOAD and LIST — were common English words, others weren’t. Moving to a new computer often meant learning new sets of incantations. As with all software, operating systems and applications based on command line interfaces implement conceptual models. However, these conceptual models are not obvious; the user must learn them either by trial and error — entering arbitrary (and potentially destructive) commands — or reading the manual. (An activity so despised it’s acquired a vulgar acronym: RTFM.) Studying manuals is time-consuming, cognitively taxing, and somewhat scary. This held back the potential of computers for a long time. Of all the computers I’ve owned, the Macintosh SE/30 stands out as one of my favorites. 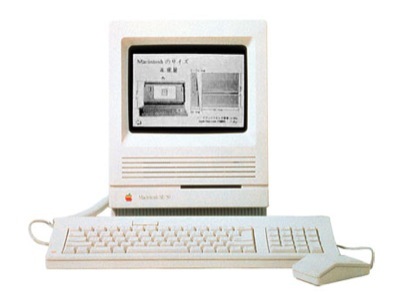 It came out a few years after the original Mac, and was a significant improvement over its predecessors. A design career is a progression from thin markers to fat markers. When you’re starting out, someone else gives you direction. You’re expected to fill in the details using very fine lines. To do so, you must understand the characteristics of the materials you’re representing on the paper, whether they be code, words, images, or bricks. Once you’ve mastered the details, you can graduate to Sharpies. You can’t get too granular with Sharpies. This is good since it allows you to focus on the relationships between elements without getting lost in the details. You now understand how things can fit together locally. You can also identify, define, and convey patterns that allow designers with finer markers to work faster. Eventually, you move up to whiteboard markers. With these blunt tools, you explore systemic issues: how elements relate to each other at the highest levels, how the outside world interacts with the system, how the system will evolve resiliently, who is responsible for what. You do this with collaborators in real-time; this includes stakeholders with concerns that are very different than yours. You develop gravitas and political savvy. At the whiteboard, you have an audience, and the stakes are high. This audience includes designers wielding Sharpies and fine markers. Now you’re the one giving direction. As the person wielding the fat marker, it’s your responsibility to nurture the people using markers finer than yours, so they move on to fatter markers. You must also bring in new people to take up the fine markers others have left behind. You can’t design exclusively using whiteboard markers any more than you can with only fine markers. You need a combination of both. Good design managers help their teams master their skills and broaden their perspectives, and keep a vibrant mix of line widths in play. As a leader, you don’t necessarily stop being a practitioner; you just move on to a fatter marker. The words landed like two bricks. What could be less appealing to an executive than spending money for his or her people to take off work, get riled up, and then… nothing? My friend was saying that what I was proposing was, at best, a distraction. Given the way many workshops are run, he’d be right. It’s undeniable that a special energy emerges when people leave their routines to focus on a specific problem for a couple of days. I’ve seen teams be incredibly engaged and creative in these contexts many times. But then what? What happens when they’re back in their cubicles? They return to the same patterns that led to needing the workshop to begin with. There must be a way to build on the momentum generated during workshops so that “nothing happens” becomes “everything changed”. It turns out there is a way to do this, and it’s based on a solid framework that’s been around for a long time. If you design software, you need to know about placemaking. Why? Because the websites and apps you design will create the contexts in which people shop, bank, learn, gossip with their friends, store their photos, etc. While people will experience these things primarily through screens in phones, tablets, and computers, they actually perceive them as places they go to to do particular things. Your users need to be able to make sense of these information environments so they can get around in them and find and do the things they came for, just as they do with physical environments such as towns and buildings. People need to form accurate mental models of these environments if they are to use them skillfully. As a discipline, software user interface design has only been around for about sixty years. However, we’ve been designing places for much longer. There’s much we can learn from architecture and urban design to help us create more effective apps and websites. This article is a short case study in the design of a particular physical environment that has valuable lessons for those of us who design information environments: Disneyland. The world is a little scary right now. In many places, the old ways of being are going away. Many people are having a hard time understanding where they fit in, and they’re reacting by making choices that go against their best interests. You’re not aware of this because mama and I are trying to not worry you, but it’s happening. A few days ago, the United Kingdom voted to leave the European Union. This is a big change in the world, and it was triggered in no small part by fear, ignorance, and cynicism. In the United States, a dangerously unfit man is running for president by stoking the basest impulses in people, and finding support among many. And he’s not the only one: so-called leaders are once again gaining a foothold in many countries by fanning hatred and fear. I say “once again” because this has happened before. Almost eighty years ago, the world plunged into a terrible war under similar circumstances. More than 60 million people died, and many more were left without families or homes. I hope you don’t experience anything that awful in your lifetimes. But it could happen, so I want to do everything I can to make the world safe for you. You’re too young to understand, so I’m addressing this essay to your future selves. I’m publishing it as an open letter because I think other people could benefit from it too.